Based around Intel's 8/9th generation CPU, this pre-built bundle is ideal for customers looking to take the strain out of putting the core components of a PC together. 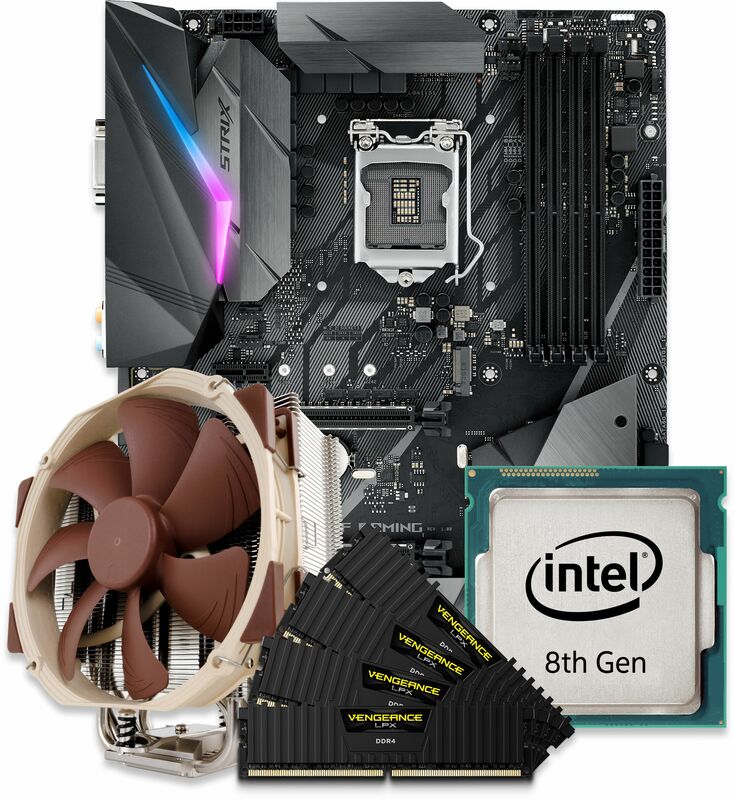 This particular bundle includes an 8th or 9th generation Intel CPU, ASUS motherboard, RAM from Corsair and your choice of either a fanned CPU cooler from Noctua or a fanless one from Nofan. As with all our bundles, our experts will assemble it and run specialised software to ensure it all works as expected prior to shipping. As with our fully built systems, we only offer the very best components in our bundles. Intel are without a doubt the most popular processor manufacturer in the world. Their latest 8th gen CPUs offer great performance and feature a wide range of performance levels from their quad-core Core i3 range all the way through to the high-performing six-core Core i7. We also have a selection of 9th generations CPUs available. PLEASE NOTE that only the Z390 motherboard selectable in the configurator below is compatible with the 9th gen CPUs. ASUS have been the UK's number one motherboard manufacturer for years. When you look at the quality of their motherboards it is not hard to see why. This particular bundle can be assembled with the feature packed Z390 chipset for extreme performance. We have two brands available here, Noctua and Nofan. Noctua have catapulted themselves to be a contender as one of the best CPU cooler manufacturers with their high-quality and very quiet coolers. Nofan are currently the only CPU cooler manufacturer that produce fanless CPU coolers for processors that output up to 95W TDP. Please be aware that if you choose a Nofan fanless CPU cooler your chosen chassis must have ventilation holes on the roof of the chassis. This allows the warm air produced by the processor to naturally dissipate out of the system. In recent years, Corsair have expanded their product portfolio to include many different types of PC related products but they are most popularly known for memory. The memory we use in our bundles is the Corsair DDR4 Vengeance LPX. When building a new, PC we understand that it can be a nightmare to decide which components to choose and whether or not they will be compatible. If you take the plunge and go for one of our bundles, we guarantee that the components will work together flawlessly. These components are the same as we use in our fully built systems, therefore we are extremely confident they will work in your chassis of choice. ASUS PRIME B360-PLUS ATX LGA1151 Motherboard ? ASUS PRIME Z390-A LGA1151 ATX Motherboard ? 3.7GHz Intel 9th Gen Core i5 9600K 6C/6T 95W 9MB CPU Z-series only ? 3.6GHz Intel 9th Gen Core i7 9700K 8C/8T 95W 12MB CPU Z-series only ? 3.6GHz Intel 9th Gen Core i9 9900K 8C/16T 95W 16MB CPU Z-series only ? Noctua NH-U9S Ultra-Quiet Slim CPU Cooler ? Noctua NH-U12S Ultra-Quiet Slim CPU Cooler ? Noctua NH-U14S Ultra-Quiet Slim CPU Cooler ? Noctua NH-D15S Dual Radiator Quiet CPU Cooler ?